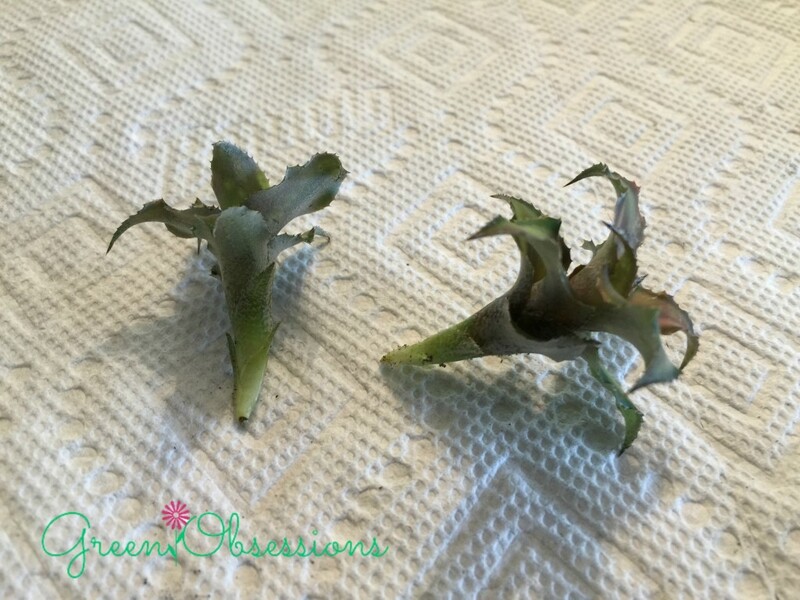 This was an unplanned post, but felt I had to make one about these lovely, unusual house plants as I was propagating by separating the offsets. I purchased a pot of earth stars a few weeks ago and decided it was time to put the offsets in their own pot. Because I had not planned on posting this, I do not have a picture of the whole plant before I divided it up. Sorry. Earth stars or Cryptanthus are so termed because of their shape. They belong to the Bromeliaceae or pineapple family and come from South America. The genus Cryptanthus has over 1200 varied species which naturally grow in tropical areas 1 . Unlike most bromeliads that are epiphytic, Cryptanthus are true terrestrial, growing in soil with a few grow among rocks (saxicolous )1,2. 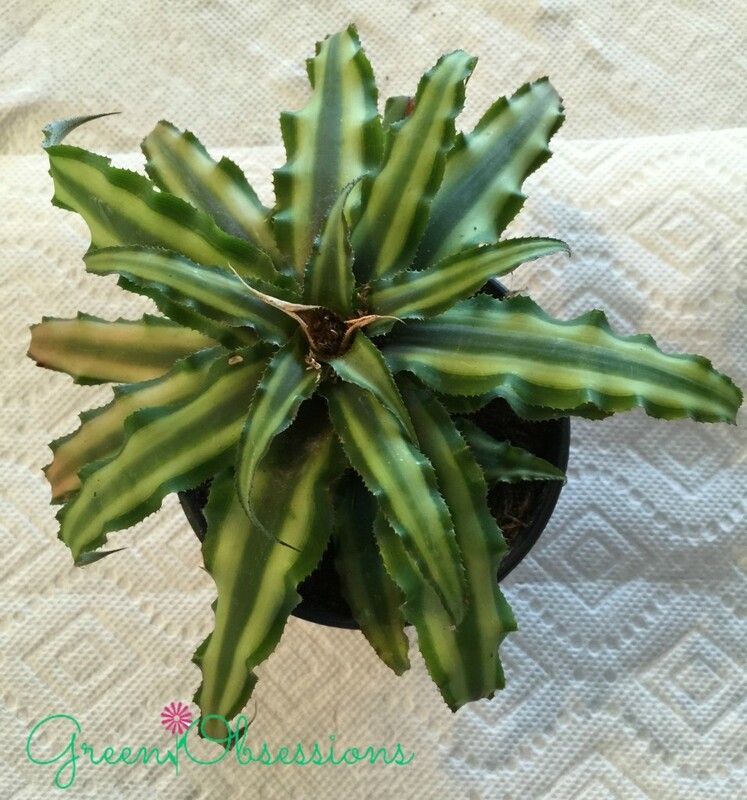 They develop extensive root systems and are not suitable for mounting according to the Cryptanthus Society. This is surprising as I have seen a few pictures of mounted Cryptanthus and they are beautiful. I was at one point tempted to mount my own until I read this about them. I may still do so as succulents are terrestrial yet do well as vertical gardens. I am curious to know how well they grow mounted. Cryptanthus grow in clumps of rosettes and have stiff but not so prickly foliage with colours ranging from dark green to olive, pink, red and even brown. The foliage can be striped, spotted or solid. Their colour is made prominent when in bright light but fades if enough light is not provided. 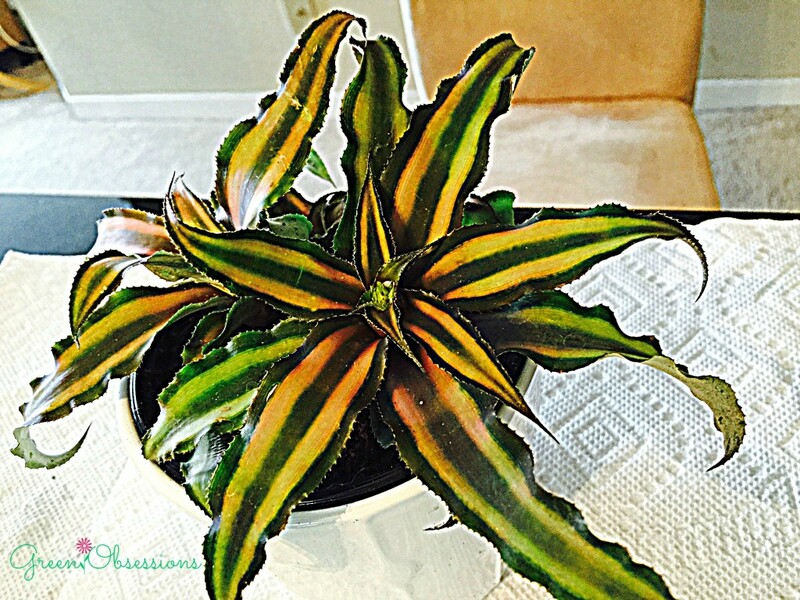 Cryptanthus prefers bright filtered light (no direct sun), warm and humid environment. They will do well in terrariums. 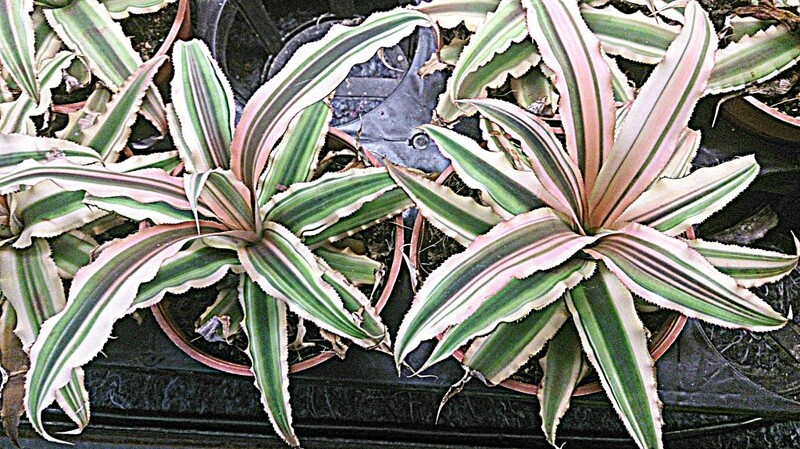 Soil must be water retentive than most mixes other bromeliads prefer but still well-drained. I just re-potted mine in cactus soil. 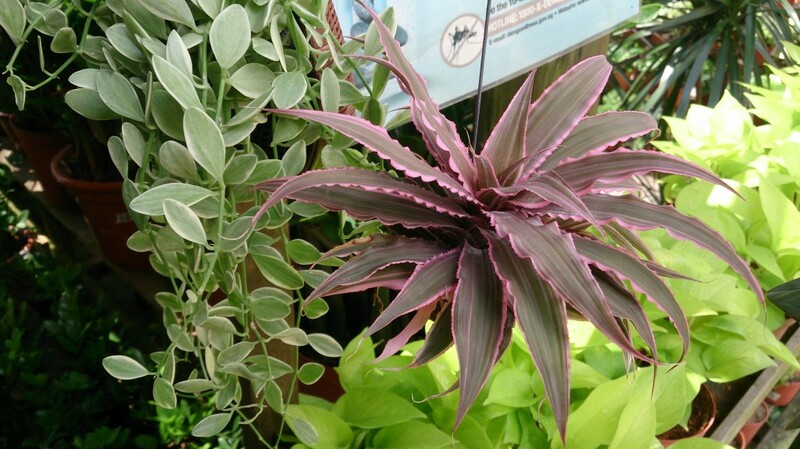 The name Cryptanthus is Greek in origin and means “hidden flowers”. The name is a bit deceiving as the flowers are mostly visible although not overbearing. The flowers are white except one species of Cryptanthus that has yellow flowers1. Cryptanthus flowers only once in its lifetime after which they produce offsets or pups originating from the base of the plant, stolons or the leaf axis3. This can also occur before blooming as I have observed in other bromeliads (i.e. Tillandsia). The plant can be left alone to grow in clumps or the offsets can be separated when they are at least 1/3 the size of the mother, which is what I did with mine. My plant had 4 visible offsets and I later noticed 2 tiny hidden ones which I left intact. I pulled 4 offsets off in total. There were 2 small ones of the 4 which weren’t quite as big (less than 1/3 size of mother) but pulled them off anyway. The offsets were easy to separate from the mother with a little twist and tug. Both of the big offsets had small roots starting while the 2 tiny ones did not. Not to worry though, you can place the bottom tip of the offset into the soil just the same and pat soil around it and it will easily grow roots with once weekly thorough water1. Treat the offsets as adult plants. Stake the rootless offsets if necessary to prevent it from moving in the pot . During this Christmas season, homes are decorated with poinsettia, holly, mistletoe and Christmas trees. I suggest Earth Stars as another colourful alternative to deck your halls with this Christmas season. 2. Choo, S. (2010, ). Starry, starry bloom. New Straits Times. 3. Cryptanthus Society. How to grow earthstars. I have a pink one. Right now the pink is in spots. Would love to have a stripped one like the picture to the right.